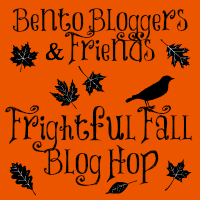 Click the Frightful Fall button below to scare up some fun at Crazy? Maybe! Blog! 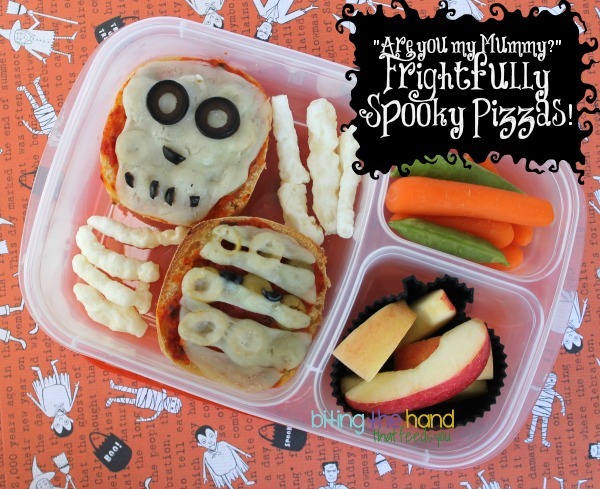 But first, read more about MY frightful lunches! I needed to use up a package of Schaar gluten-free ciabatta rolls before they expired, but couldn't figure out what to do with them... until I thought of making pizzas! I keep snack-sized baggies of pizza/spaghetti sauce in the freezer, so I can make pizza whenever I want without having a whole jar sitting around in the fridge getting moldy. (I keep the snack baggies inside a freezer bag, to prevent freezer burn. And to keep them all in one place!) They thaw pretty quickly too, especially when set in warm water. So I was able to pre-cook the rolls and work on the rest of the lunch while the sauce thawed, and then make the pizzas, all in under 30-minutes! I'm a lazy pizza maker. I don't have a lot of patience, so after cooking the rolls as directed, I turned the oven to Broil, then toasted the tops for a few minutes, then added the sauce and olives, then the cheese and details, then broiled again for a few minutes to melt the cheese a little. Voila! The hardest part was running out of black olives, then emptying the pantry in search of another can, only to discover there wasn't one... green olives it is! Are You My Mummy? : I wasn't really sure how I was going to pull off a mummy, but decided to try and wing it. I used a circle cutter on a slice of dairy-free "mozzarella," and then started cutting it into uneven slanted strips. I realized that I'd just have to lay them onto the pizza as-is, and just leave a sliver of space between, and they would look like mummy bandages! Perfect! I stuck a few olive bits in between some "bandages" to hint at eyes. Skully Skelly: I would like to say that I used my skull cutter to cut the skull cheese. But no. Couldn't find it. I don't recall ever even using it before, so no clue how it escaped from my Halloween cutter tote... So I cheated and cut the picture of the cookie from the cardboard backing, then I kept in the tote to help me see at a glance what cutters are in there. Then I used a knife to trace around the cardboard shape on the dairy-free cheese! Ha! Since the only Halloween-y silicone cups I have that fit in the bento boxes are silicone pumpkin cups, I went ahead and used a black one, even though it isn't monster-y. Little E is too young to recognize a skeleton or mummy (much less know what they even are!) so I didn't bother going to all that trouble for her ciabatta pizza. Just a happy little skelly for her, complete with "skeleton bone" rib cage! I found these crunchies at World Market. Basically, they're white cheddar Cheetos-style... chips? sold for Halloween as "skeleton bones." Perfect! Now I want pizza for lunch!! Your idea of having small amounts ready to go is pretty much genius. I fail to make pizza unless we are making several large ones for the very reason you mentioned. We never use all the ingredients, especially the sauce!! 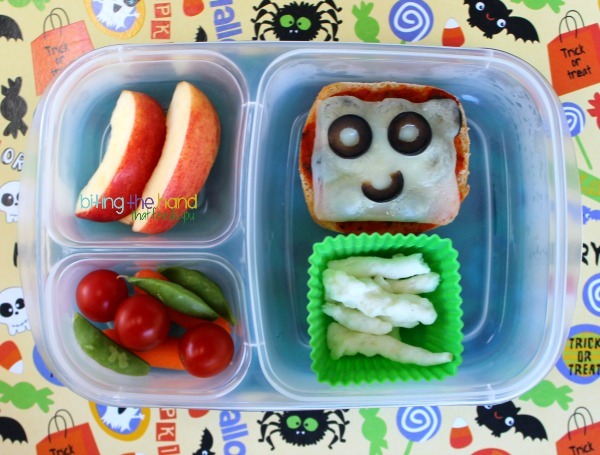 I love your lunches, a little spooky and cute! Love the pizzas and the tip about the sauce. The skeleton pizza is awesome I dont know how you got it to melt so perfectly. love love love the pizzas! 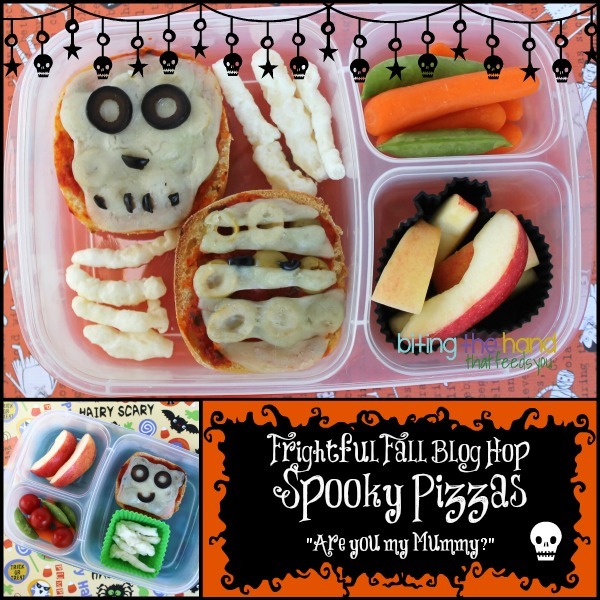 I love those spooky pizzas! Yum! My kiddo would love to eat your cool pizzas. That skull turned out GREAT!